Prince of Peace Honey Ginger Crystals- This is one of our favorite staples here at home. We always have this in our cupboards. My husband has digestion issues and he drinks this as a hot drink to calm his gut. He also drinks it before bed to prevent acid reflux. It is VERY gingery so you must like ginger. It's too spicy for me to use a whole packet so I just use a quarter of one when I need it. It still works. Ginger is very effective and the addition of honey makes this very palatable and totally worth it when you need it. We get giant bags of packets at our local Asian grocery. Highly recommend if you have any issues with upset stomach. 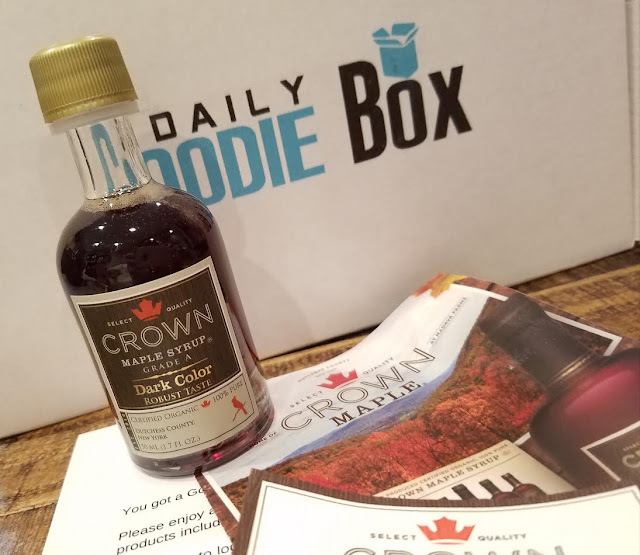 Crown Maple Syrup Dark Color- I've tried this before in a subscription box. I received a 3 pack. My favorite is this one, the Dark Color. I didn't like the Golden version, especially compared with the complexity of the darker versions. The website describes it like this: "Aromas of coffee and cocoa beans are present, along with flavors of brown sugar and toasted almond." I just say it's delicious. BiPro - Protein Water Berry Burst- This is fun! I've been working on getting more protein into my daily diet and this is an easy way to do it. This is Berry flavored and it tastes like grape which I hate so I gave it to my husband. However they have a Peach flavor, too. Hm. I don't know if I'm willing to pay $5 for it though. 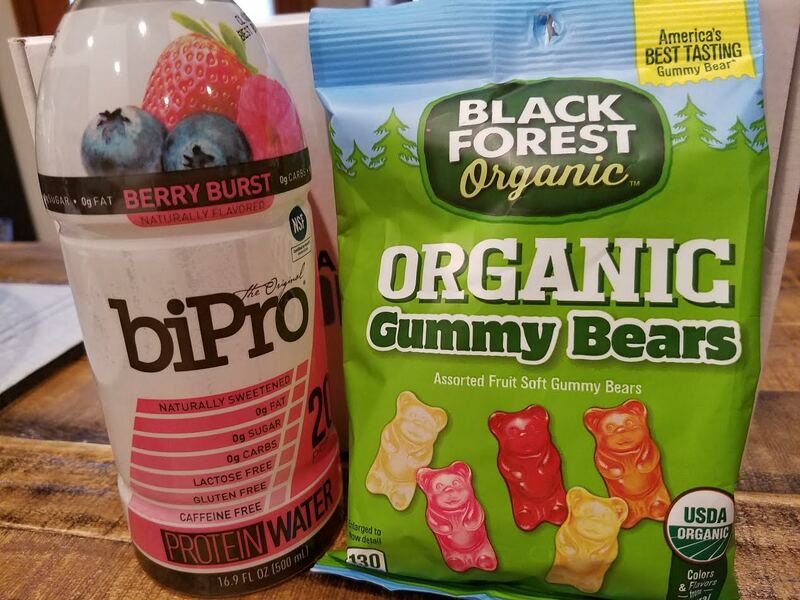 Black Forest Organic Gummy Bears- Who doesn't like Black Forest Gummy Bears? These are not as flavorful as I hoped and I don't appear to have gotten any pineapple ones. I think they're not quite as chewy as the non organic kind (which I think I prefer just based on texture). But for those looking for an organic alternative, here it is! VitaBath - Travel Size Body Wash- Oh my gosh, this smells absolutely amazing. It's Heavenly Coconut Creme scented and it's making me drool. There might be a fight in the shower over this one since coconut is one of my husbands favorite scents. Goddess Garden Mineral Removing Cleanser- Sadly, I'm unable to try this because it's got lavender and I avoid products with witch hazel extract (because of the alcohol). Tiger Balm Pain Relieving Ointment- I used this on my neck since I basically live with neck tension (especially on my mouse-hand side). It's a strange product that doesn't really fix the problem, just distracts your brain from the pain by making it focus on the fact that you just put irritants on your skin. The hoped for result is that because you stop thinking about your pain, you stop catering to it and instead use it as you normally would. I do think there's a slight benefit from that but mainly I just like the way it smells... Mmmm, cinnamon and clove! BetterThanCoffee Energy Bars- This seems to be the new thing-- caffeine in energy bars. This one is Dark Chocolate Mint and is made with pea protein, brown rice, a bunch of organic sugar and chocolate plus... guarana! It contains 100mg of caffeine. Taste? I'm sorry but it tastes horrible. I'd rather drink coffee. Wow. It has a very strong almost medicinal taste. Blech. 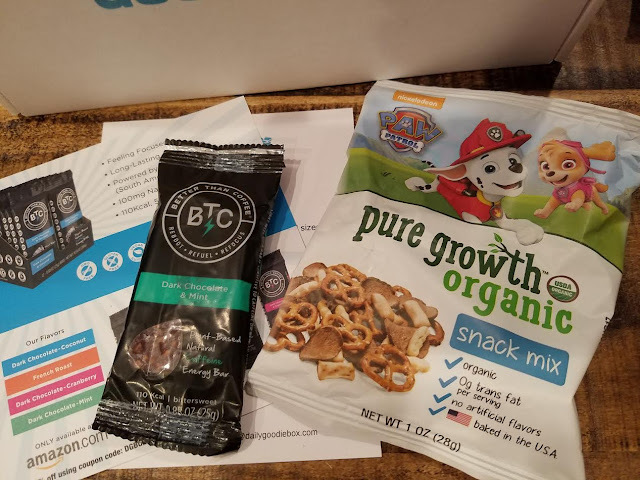 Pure Growth Organic Snack Mix- A tasty snack mix sort of like Gardetto's but ranch-ish flavored. Bonus for being organic and having no artificial flavors, etc. Tasty! And it's a nice sized bag perfect for snacking. It has pretzels, breadsticks and those brown bread disks (my favorite part of Gardetto's). VERDICT: A lot of fun stuff! I'm a little distracted because I accidentally got Tiger Balm on my chin and it's driving me nuts. Seriously. Dying. Also, I cannot get rid of that horrible taste from the BetterThanCoffee bar. So bad. Anyway, I'm pretty pleased that this had so many good products in it. I'm happy for everyone who gets to try the Prince of Peace crystals because they're amazing. 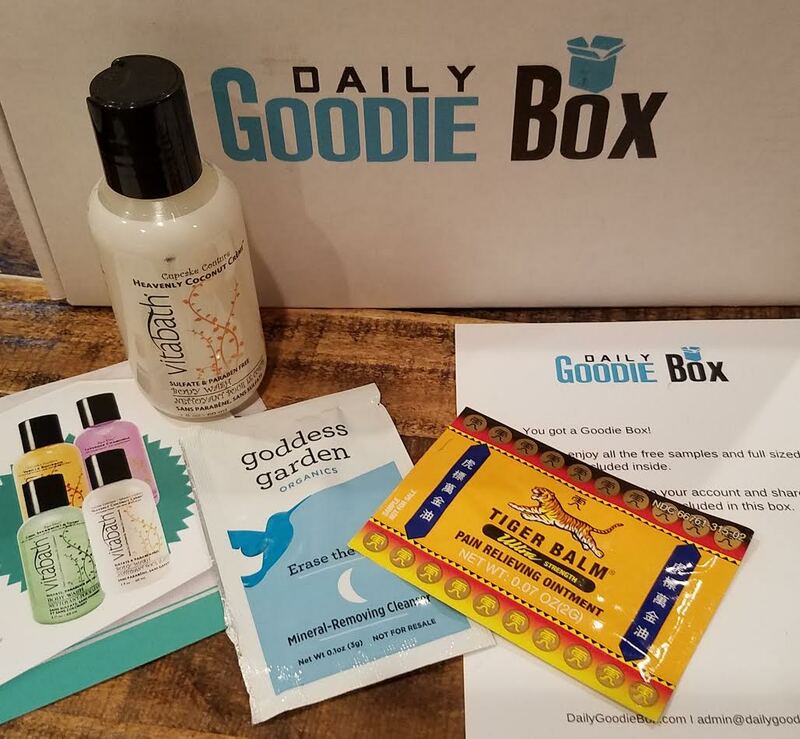 As a whole, I think DailyGoodieBox is the best freebie product review program that I know of. I love how low stress it is. 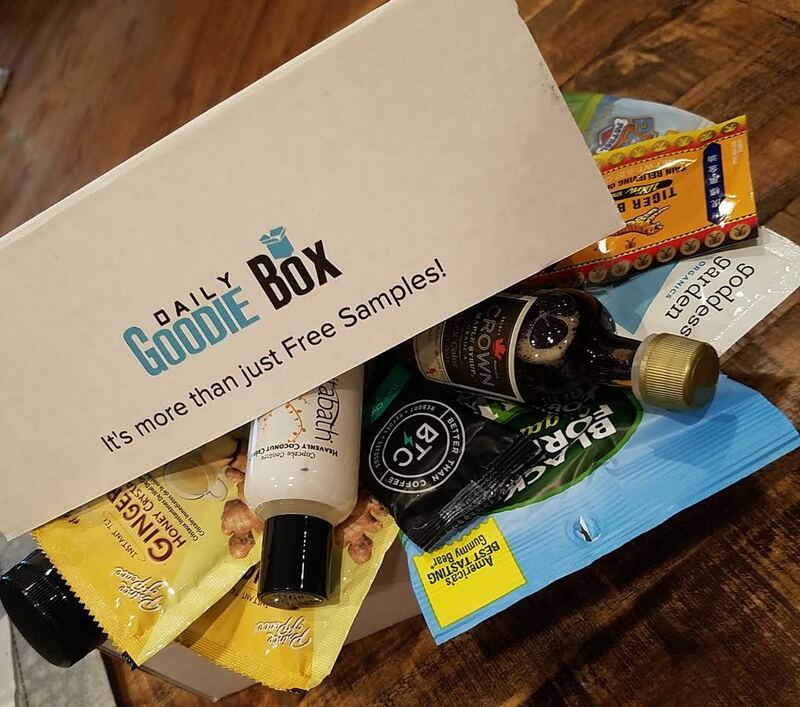 If you would like to get your own box, sign up at www.dailygoodiebox.com and fill out your profile. If you are extra industrious, you can follow them on Facebook and interact on their page for the opportunity to win a free box. I think they do those daily. Once you get one make sure to go back to your profile and give your thoughts on each product. That increases your chances of getting another one. 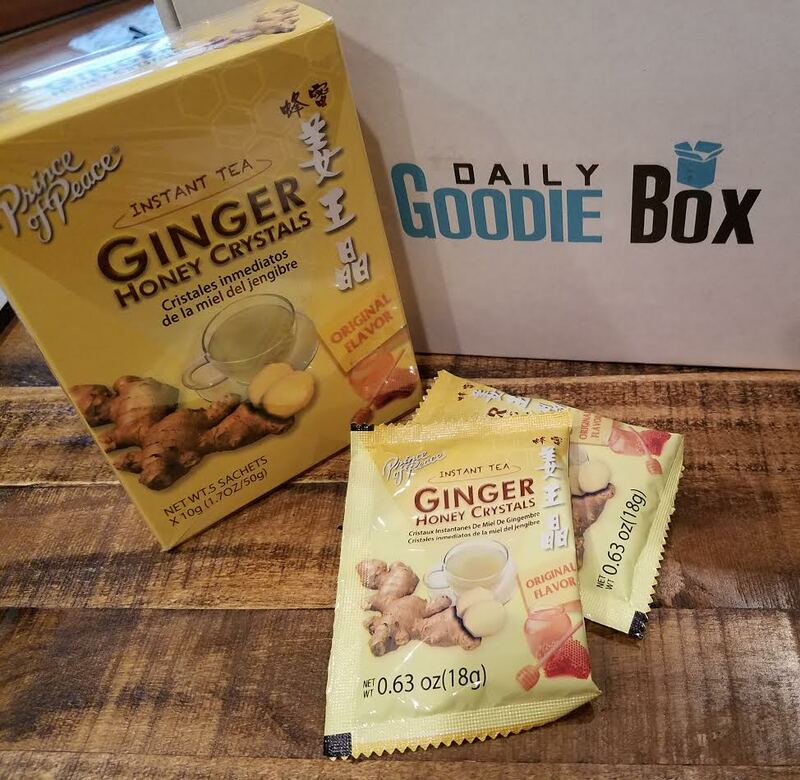 Have you received a DailyGoodieBox yet? What did you think? *This box was sent complimentary. Entire program is completely free, even shipping. Oh I'm so mad we don't have a thing like this in the UK. We only just got our own UK Influenster! I think it's adorable that those snacks have paw patrol on the front, my niece is obsessed with them hehe. I bet you'll get one sooner or later. UK is catching on, I think! Influenster is a lot of fun although they want a lot more from me than I'm willing to give. Mainly in the form of going to stores and taking pictures of their shelves. Who has time for that?! Haha! Luckily none of it is required but I always feel bad when I don't do every single thing. Did you apply for Influenster?